The sci-fi movie “Level 1 Player” has a wonderful museum. You only need to tell the robot curator what information he wants to check. The curator will automatically call it out for you. You don’t have to take the book code and look for it in the maze. In reality, libraries for robot management have also appeared. At North Carolina State University, there is a large building in the shape of a stapler. The glazed curtain on the exterior wall shines in the sunlight. At first glance, it is considered to be a uniquely designed Apple Store. In fact, this is the school’s Henry. James B. Hunt Jr. Library. The Apple Store is arguably Apple’s most beautiful hardware. It is a model of combining technology and aesthetics. In this respect, the Hunter Library is not at all rude. The Hunter Library covers more than 21,000 square meters and was built for $130 million. It was designed by Norwegian architects Snøhetta, the futuristic New Alexandria Library in Egypt and the Oslo Opera, known as the “Norwegian Postcard”. The courtyard is the work of Snøhetta. 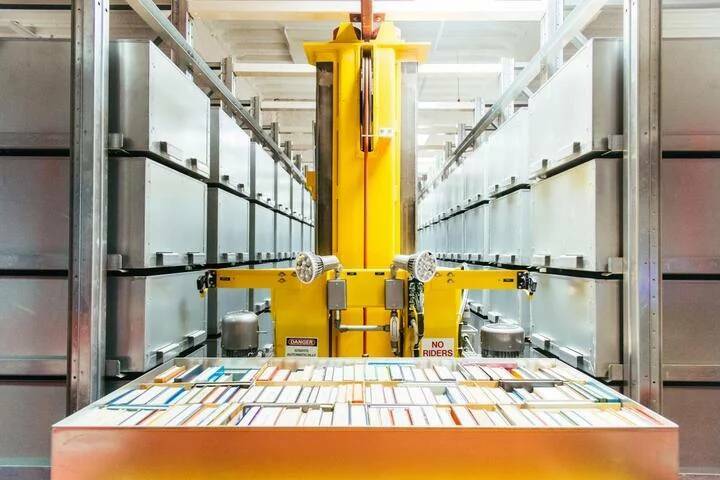 The most special thing about the Hunter Library is the introduction of an automated book borrowing system, bookBot, which is controlled by a supercomputer. Visitors can find and send books in 5 minutes by simply checking the books they want to borrow in the system catalog. Go to the library counter. The bookBot system is designed by Dematic, an automated supply chain service provider. The robot system requires as much as one-seventh of the space in a traditional bookshelf, saving more than 18,500 square meters of floor space and storing more than 2 million physical books. However, the introduction of the robot system was initially a helpless move. The original Hunter Library’s construction budget was $150 million, but it was unfortunate that in the 2008 financial crisis, the budget was cut off by $11 million, but Snøhetta was reluctant to reduce the size of the building. So I tried to use every building space. In addition to the bookBot system, the glass curtain of the Hunter Library also uses a lot of technology. 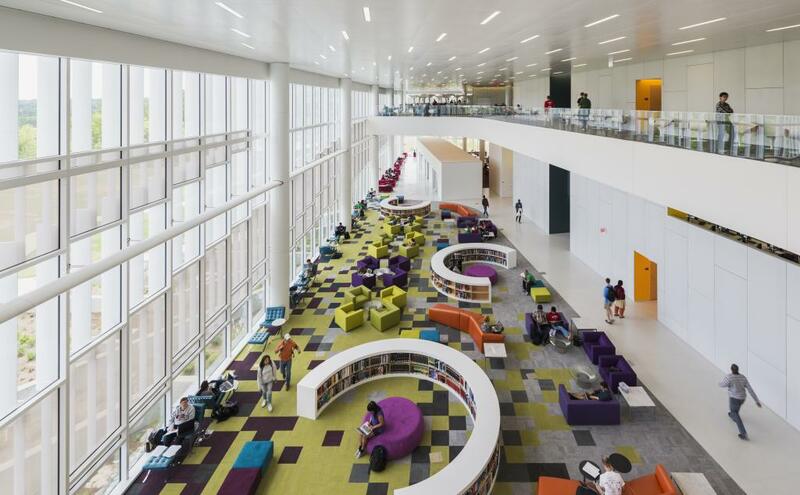 The low-temperature glass frit external shading system consisting of floor-to-ceiling glass and aluminum alloy sheets allows the library to maintain sufficient natural light while not causing excessive indoor temperature due to direct sunlight. 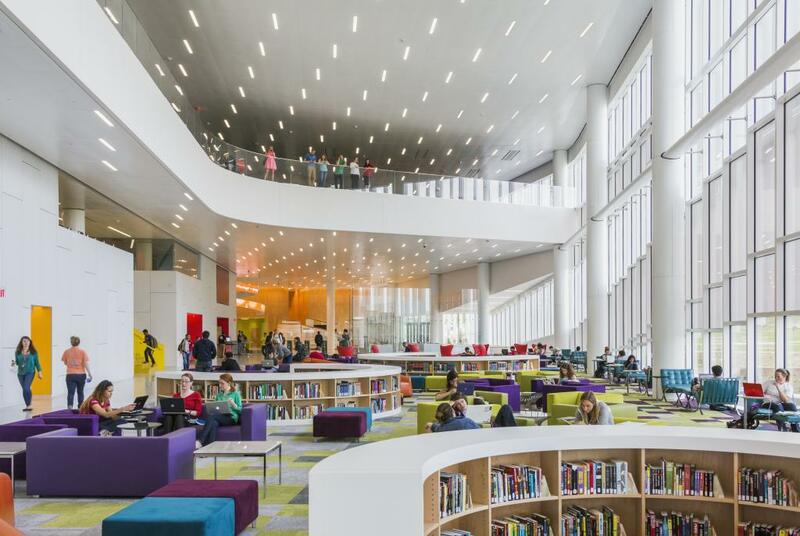 At the same time, the library installed more energy-efficient active chilled beams and radiant panels, combined with roof gardens and rainwater harvesting systems to control indoor temperature and ventilation. In addition, 31% of the entire building was recycled and also received “green” The Oscar is known as the Energy and Environmental Design Pioneer Award (LEED) Silver Certification. Although the bookBot system has basically replaced the work of librarians, there are actually librarians, but their job is no longer to handle book lending, but to assist students in using various digital tools to complete research and homework. Inside the Hunter Library, there are several interactive high-definition screens that provide a variety of materials and a variety of digital media studios. The game lab not only allows students to play games, but also develop their own games, as well as 3D printing studios, high-tech exhibition areas can experience all kinds of the latest electronic devices, even the US Navy also uses the simulation system training courses here. 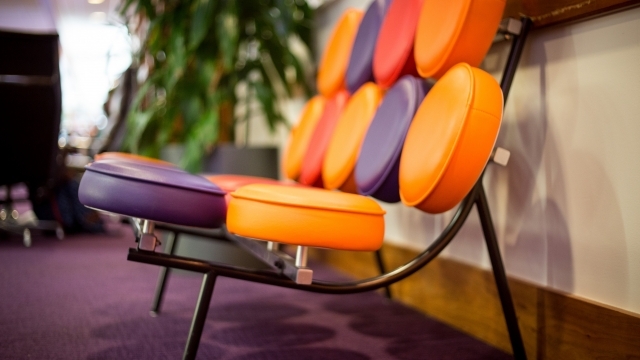 Also worth mentioning is the Hunter Library chair, which has more than 80 chairs designed in different colors, shapes and styles. 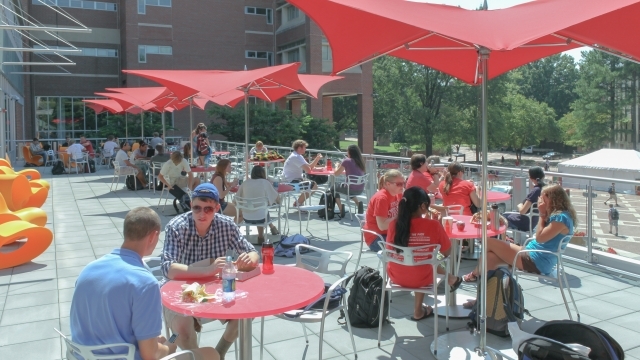 The University of North Carolina students even made a website dedicated to each of the libraries. chair. The Hunter Library is not only a huge wheel filled with knowledge, but also a group of people who gather to exchange ideas. 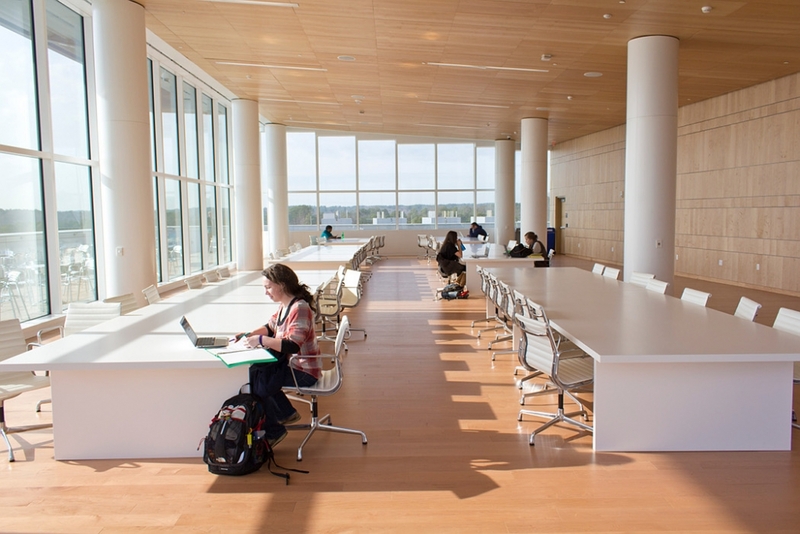 The Hunter Library is a place where people meet, exchange and discuss new ideas. It is more like an incubation space. It is not only a place to borrow knowledge, but also a place to create new things. It must be said that regardless of the design style combined with technology, or the design concept of social networking, Hunter Library coincides with the Apple Store, which may be the future of the library, the combination of technology and humanities. Previous AI can beat the world champion in Go, why not play card games? Next Facebook wants to be the next WeChat, hard!